As the old saying goes, “there’s more than one way to skin a cat”. So it is with trying to have an impact on your government. 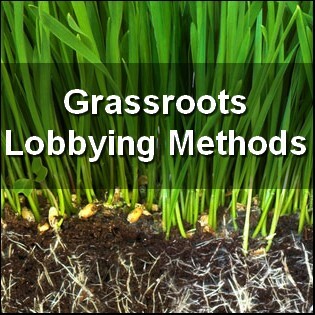 There are lots of ways to go about it, but there are tradeoffs between different grassroots lobbying methods that you should be aware of. Generally, the more personal and spontaneous the action the more influential it can be, but the harder it can be to generate big numbers. For example, it’s easier to get thirty people to sign a pre-printed postcard than it is to get them to write their own letters. The type of lobbying that you should choose to do depends on your situation. Before deciding which methods you’ll use, give some thought to the resources (current and likely) that you, your group or your cause can bring to bear. Make a list. This will give you a better idea of your strengths. Choose those that you’re best equipped for and that everyone is most comfortable with. Don’t try to do everything. Focus. It’s better to do a few things really well than attempt to do a lot and only manage a half-way job. This can make you look weak. Petitions: either printed versions that you distribute to get signed, then collect and deliver to your targets, or online versions (so long as you can print a list of those who have signed). Pre-printed post cards: cards that you’ve had pre-printed with a message about your issue and pre-addressed to targeted officials…needing only a signature from a supporter. Personal letters: sent from supporters to targeted officials based on some pre-written “talking points” on the issue that you’ve provided, (encouraging people to put things in their own words). Phone calls: made by supporters to targeted officials, working from pre-written “talking points” on the issue. Town-hall meetings: holding a meeting in your area on the issue and inviting targeted officials to attend and answer questions. 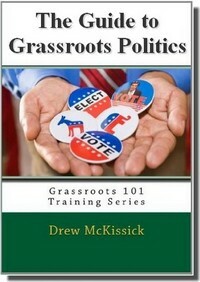 Personal meetings: individual supporters go meet personally with targeted officials. “Lobby day” at the legislature: large groups of supporters go to meet with targeted officials on the same day. 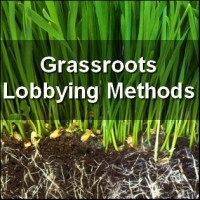 “Grasstops” lobbying: any of the same personal types of contact, but made by individual supporters who are also very influential or well known in the community. Also, don’t forget one of the most often overlooked lobbying techniques: saying “thank-you”. Meaning, remember to thank those who are helpful or “vote right” when you need them. It will be that much easier for you to go back to that well the next time if you didn’t poison it this time by being rude or forgetful. Remember that you can use online “groups” from services such as Google, Yahoo, Facebook or Ning to coordinate your activities. And don’t forget to leverage your efforts by focusing your time on officials where you can have the greatest impact and not to waste time on “hopeless” elected officials. In the end you want to use the methods that you have the resources to use well. And focus them where they will have the greatest impact.